This is dedicated to Patrick Wilbraham, who can't be with me today, because I'm the only one working in my office. It's a pleasure to meet you, sir. I am contacting you today because of a breakthrough I recently had in the field of ideas and progress. You see, last weekend I was at the volunteer's banquet for the Southwest-Central Ohio Iditarod, a bi-decade dog sledding race that I founded for the benefit of the Midwest, when my feet began to hurt in my dress shoes. I was wearing a pair of sandy brown leather Moschino wingtips, and my entire foot was on fire. The toe was tight and restricting, and the heel gave insufficient cushioning during the bolero beat of Poncho Sanchez's Son Son Charari. I looked at the women dancing around me, and several of them had also eschewed their fancy footwear to go barefoot on the sawdust-covered dancefloor. Well, I immediately thought of my Crocs-brand clogs, which I always wear in the gymnasium while working with my dog team. I can stand on a hard sled for hours without feeling a thing, and their durable yet gentle foam-rubber body is perfect for kicking an ornery Alaskan Malamute in the ribs. So I melding the two ideas in my head, and before you know it, the idea of Croc-brand dress shoes was born. Now, I know what you're thinking. The last thing you need is another usurper trying to wrest money and power from your commission as Crocs president. I can guarantee you that is not my goal, and you can have my ideas free of charge. To be honest, I stay busy as it is with my sledding and philan-tropical causes (I'm half Haitian, and I love to give back to my people). No, you can take this idea and run with it full-force, and to back it up I'll sign any piece of paper your lawyers can come up with. 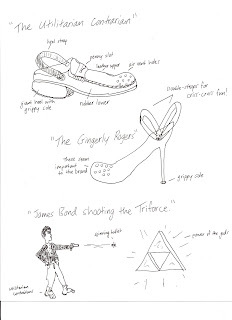 I even drew some rough sketches of the first Croc formalwear prototypes. Go ahead and use the names I came up with, too - inspiration was meant to be shared! I hope you'll soon have these new models on the buying market, as I will be attending another ball in March for the Midwest Euchre Invitational. Margaret Bath, VP of Research for the Kellogg Company will be there, and she can cut it on the dancefloor harder and faster than a SlapChop! The illustrations really bring the message home. Why, when I Google "Southwest-Central Ohio Iditarod," only see this page listed in relevant results. Is this event a farce? Please let me know, as I will have to change my vacation plans post haste. My Hero! I hope my name Londer name-twin (we're best facebook buddies now) doesn't google upon this and get confused. Illustrations are always great in your letters. Thank you once again.